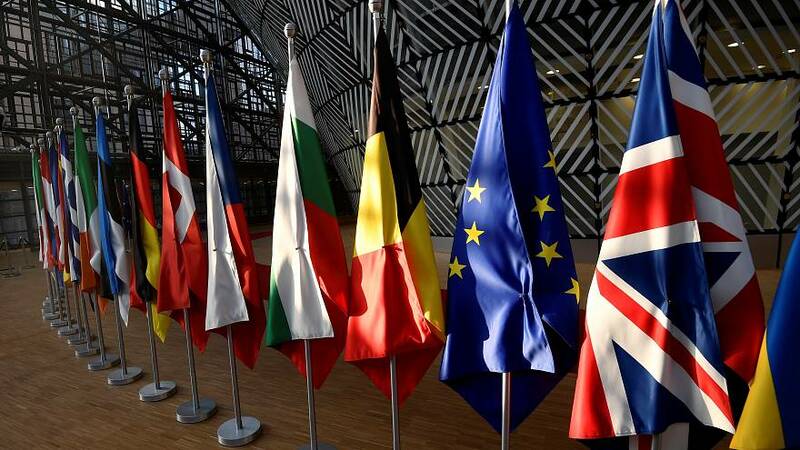 Fifty-two percent of the millions of Britons who voted in the 2016 EU referendum opted to “take back control” from Brussels – but on Wednesday the UK’s immediate fate will lie firmly in the hands of the leaders of the EU’s other 27 nations when they meet in the Belgian capital. Once again, Theresa May will be shunted upstairs at the European Council summit, while her EU counterparts thrash through the conditions for another delay – if they decide to allow an extension at all. Under the revised timetable set out at the last summit on March 21/22, the UK is due by law to leave the EU this Friday, April 12, without a deal. The British prime minister has written a letter to the council’s president, Donald Tusk, seeking an extension until June 30. Instructed to “indicate a way forward” – given that her Brexit deal bombed for a third time in parliament – she can point to her search for a winnable compromise by launching cross-party talks. The debate among EU leaders is thought likely to focus on how long an extension to grant the UK, and on what conditions. Like May, the EU does not want a disorderly, chaotic exit this week. But many politicians are increasingly wary of an alternative scenario: where in their eyes an unhappy UK still in the bloc infects the EU with its toxic, unresolved Brexit debate. As Theresa May makes last-minute visits to Berlin and Paris to state her case, here is what some of the main European players have been saying about the UK’s request for another delay. The German chancellor has long argued for a mutually-agreed, managed Brexit. However, she has also stated that any delay must not “undermine” European Parliament elections in May, and she prioritises EU unity and the integrity of its institutions. “We want to do everything to ensure there is no disorderly UK exit – and we’ll expend a lot of strength to that end,” she said last week. "We will make major efforts to avoid a hard Brexit, but we have to do that together with Britain." On her visit to Ireland she made a point of asking what Prime Minister Leo Varadkar described as “reasonable questions” about what would happen to the border if the UK left the EU without a deal. Another factor in Germany’s thinking about a no-deal Brexit may be the potential hole in the EU budget. Berlin would probably have to provide a short-term cash injection of several hundred million euros to help plug the gap, the EU’s Budget Commissioner Günther Oettinger warned last week. The French president took a harder line when he was in the presence of the Irish Taoiseach last week. “The EU cannot be held hostage to the resolution of a political crisis in the United Kingdom on a long-term basis,” he said. Macron said France was “open” to a lengthy Brexit extension, subject to conditions, but he added that it was “neither a certainty nor automatic”. Paris has been becoming increasingly frustrated with the UK’s paralysis over Brexit, which is distracting from Europe’s other concerns – and Macron’s presidency from tackling EU reform. Reports have suggested that France won the recent backing of Spain and Belgium in its readiness for a no-deal. But several commentators believe a French veto of an Article 50 process is very unlikely, arguing that Macron will not wish to make such a divisive move – and one that could encourage Eurosceptic leaders to take similar forthright stands on other issues. Buzzfeed has quoted diplomatic sources as saying Macron is adamant that Brexit cannot be delayed beyond December 2019, and will ask the other 26 EU leaders to impose compliance checks on the UK every three months during any extension. The Irish prime minister has urged EU leaders to give the British time to sort themselves out over Brexit. “We said that if the UK had not ratified the withdrawal agreement it should come forward with a clear plan for the way forward by next week or it would leave the European Union without a deal,” Varadkar said last week as he met Merkel. “This is an outcome that none of us want to see. Matters continue to play out in London and I think we need to be patient and understanding of the predicament they’re in. But, of course, any further extension must require and must have a credible and realistic way forward,” he said during Merkel’s visit to Ireland. “The Taoiseach repeated his openness to an extension of the deadline,” the Irish government said in a statement after Varadkar and May spoke by phone on Monday. The Dutch prime minister was pessimistic last week as attempts in the UK House of Commons to find a way forward again ended in deadlock. “We have to take into consideration a no-deal possibility. It’s a probability,” he said. Rutte has since added that the EU would need assurances of “secure cooperation” from London before granting an extension. Reports have suggested that the Belgian Prime Minister Charles Michel will host a small group of EU leaders whose countries will be most affected by Brexit, ahead of the summit on Wednesday afternoon. It’s thought they’re likely to include leaders from the Netherlands, Denmark and Ireland – as well as France, Germany and Spain. The Polish prime minister said in late March that his country was open to a Brexit delay. Speaking just ahead of the UK government's third failed attempt to get the withdrawal deal through parliament, Morawiecki said: "In the event of a negative vote, should it occur, we are open to a motion to extend the process of Britain's exit from the EU." He added that options of a six-, nine- or twelve-month extension would all be acceptable to Poland – although the reason would have to be justified. Despite Brussels' rows with Eurosceptic governments such as Poland and Hungary, unity among the EU27 over Brexit has remained largely intact. Poland's EU minister did break ranks last September by suggesting the bloc might need to overhaul its negotiating position with the UK, but the discord was brief. The EU’s chief Brexit negotiator will not have any direct input into the EU’s decision, which is up to the 27 government leaders at the European Council. However, he maintained their unity after consulting them widely during the talks. At a news conference on Tuesday, he implied that the key to a long Article 50 extension for the UK might be adherence to a customs union. The President of the European Council, the institution representing the member states, has recommended a one-year Brexit “flextension” – a delay allowing the UK the flexibility to leave earlier if its parliament ratifies a withdrawal deal. Under a draft EU plan reported by Buzzfeed, Brussels may insist that it too can cut short the UK’s membership, if for instance a new hardline Eurosceptic leader used an extension to try to sabotage EU business. Other reports also suggest the UK might need to commit not to disrupt the functioning of the EU during any extension. That might include staying out of decisions over new appointments, or negotiations over the next EU budget. EU leaders have taken note of the tweet by leading Brexit supporter, the Conservative MP Jacob Rees-Mogg, who said that the UK should “be as difficult as possible” if forced to stay in the bloc.